U.S. Supreme Court Justice Ruth Bader Ginsburg. ABA Journal file photo by Sam Kittner. The White House reportedly began quiet preparations for a possible replacement for U.S. Supreme Court Justice Ruth Bader Ginsburg after she missed oral arguments this week. The White House has told allies at the Judicial Crisis Network and the Federalist Society to ready for another potential difficult confirmation battle, Politico reports in an article relying on unnamed sources. A short list of potential nominees is being drafted by the White House counsel’s office and the Senate Judiciary Committee’s new chairman, Republican Sen. Lindsey Graham of South Carolina. Ginsburg’s absence from the court this week was the first time she has missed oral arguments for health reasons. 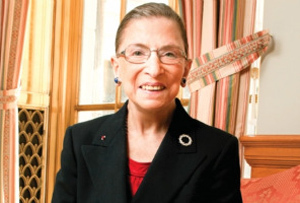 Ginsburg, 85, had surgery on Dec. 21 to remove two cancerous nodules from her left lung. She did not miss any arguments during previous bouts with colon and pancreatic cancer. Ginsburg was working from home and reading transcripts of the oral arguments, according to a court spokeswoman and Chief Justice John G. Roberts Jr. On Friday afternoon, Washington Post reporter Robert Barnes tweeted that the Supreme Court announced Ginsburg has no remaining signs of cancer and will need no additional treatment. She plans to work from home next week and will miss one more week of oral arguments. • Judge Amy Coney Barrett, who was confirmed in October 2017 to the 7th U.S. Circuit Court of Appeals at Chicago. She is a former Notre Dame law professor who had clerked for Justice Antonin Scalia. • Judge Joan Larsen, confirmed to the 6th Circuit at Cincinnati in October 2017. She previously was a Michigan Supreme Court justice and a University of Michigan law professor. • Judge Amul Thapar, confirmed in May 2017 to the 6th Circuit. Thapar, who’s of South Asian descent, was a federal judge in Kentucky before Trump nominated him to the 6th Circuit. • Judge Raymond Kethledge of the 6th Circuit is a former clerk for Justice Anthony M. Kennedy and a former in-house lawyer at Ford Motor Co.
• Judge Britt Grant, confirmed last July to the 11th Circuit at Atlanta. She previously was a Georgia Supreme Court justice, a Georgia solicitor general and a partner at Kirkland & Ellis. • Judge Thomas Hardiman of the 3rd Circuit at Philadelphia. Hardiman was the first person in his family to attend college, and he helped pay for his Georgetown University law degree by driving a taxi. • Neomi Rao, nominated to replace Justice Brett M. Kavanaugh on the U.S. Court of Appeals for the D.C. Circuit. Politico describes Rao as a “deregulation ace.” She is a former clerk for Justice Clarence Thomas and is currently the administrator of the Office of Information and Regulatory Affairs. Updated at 11:47 a.m. to add details about Ginsburg’s diagnosis and plans for next week.